We’d love your help. 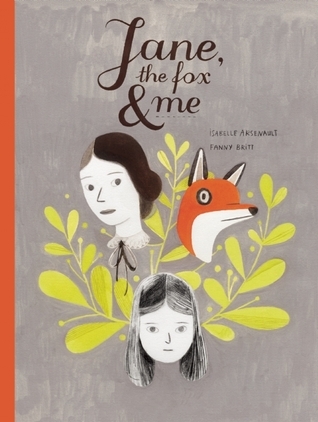 Let us know what’s wrong with this preview of Jane, the Fox, and Me by Fanny Britt. Hélène has been inexplicably ostracized by the girls who were once her friends. Her school life is full of whispers and lies — Hélène weighs 216; she smells like BO. Her loving mother is too tired to be any help. Fortunately, Hélène has one consolation, Charlotte Bronte’s Jane Eyre. Hélène identifies strongly with Jane’s tribulations, and when she is lost in the pages of t Hélène has been inexplicably ostracized by the girls who were once her friends. Her school life is full of whispers and lies — Hélène weighs 216; she smells like BO. Her loving mother is too tired to be any help. Fortunately, Hélène has one consolation, Charlotte Bronte’s Jane Eyre. Hélène identifies strongly with Jane’s tribulations, and when she is lost in the pages of this wonderful book, she is able to ignore her tormentors. But when Hélène is humiliated on a class trip in front of her entire grade, she needs more than a fictional character to allow her to see herself as a person deserving of laughter and friendship. To ask other readers questions about Jane, the Fox, and Me, please sign up. Not enough fox. A more honest title: Me reading Jane and briefly meeting a fox. Past that, not a bad book. These illustrations are amazing, I love them, this artist is so skillful at capturing body language and expressions. Some lovely images of trees and hands made to look so effortless! Brilliant. Helene is bullied at school and receives abusive comments about her weight, she seeks comfort and escapism in reading, in particular Jane Eyre. I found the storyline lacking, I gathered this was set perhaps 30 years ago due to the music mentioned, my daughter suspected it wasn't current due to the lack of These illustrations are amazing, I love them, this artist is so skillful at capturing body language and expressions. Some lovely images of trees and hands made to look so effortless! Brilliant. I found the characters of Helen and her mother interesting and would like to have learned more about them and their lives. My daughter loved the illustrations and loved the fox but felt slightly mislead by the title as the fox only appears on two pages! I have to give this 4 stars because the illustrations are exceptional. No one likes to use the "B" word, and when it is used, what comes to mind are characters like the teenage "bully" in Junior's sixth grade class in the film Problem Child 2. You remember...the one who likes picking his nose and employing the art of spitball archery. The irony is that often times, bullies are not unkempt misfits, or the posh, popular kids of the Mean Girls trio. Most of the time they're ordinary, "nice" people who were at some point close friends of yours. Helene is a young girl in No one likes to use the "B" word, and when it is used, what comes to mind are characters like the teenage "bully" in Junior's sixth grade class in the film Problem Child 2. You remember...the one who likes picking his nose and employing the art of spitball archery. The irony is that often times, bullies are not unkempt misfits, or the posh, popular kids of the Mean Girls trio. Most of the time they're ordinary, "nice" people who were at some point close friends of yours. Helene is a young girl in Montreal, who inexplicably finds herself ostracized by a group of girls that were at one time her friends. Publicly taunted about her weight at almost every turn, she takes refuge in reading Jane Eyre. If you've ever been in this situation, then you'll understand that enduring the 30 minutes before school begins without friends to talk to, or trying to figure out where to hide during the lunch period because you're afraid to eat alone in the cafeteria, are real fears for children who are being shunned. All of these things are captured so beautifully in both the illustrations and writing of this novel. Mostly cast in gray hues, the bleakness of Helene's situation, from her point of view, really pulls at your heart strings. No matter how bad things get though, there is always hope and a light at the end of the tunnel. This is expertly employed by Arsenault, the illustrator, in the burst of colors that surprise you when you turn certain pages, usually the ones dealing with Jane Eyre. This may be a children's book, but while I was reading it, I had an "a-ha" moment. I realized that this was happening to me at my place of employment; the culprits--"nice" people that I had been friends with at one time. I realized that I'd been handling it as best I could, but obviously it was bothering me, especially the comments that were overtly directed at me, and said within my hearing range. If you like the book "Jane Eyre," you will probably like this beautiful graphic novel. 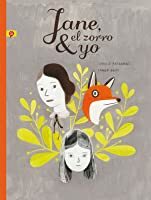 "Jane, the Fox and Me" is the story of Helene, a young girl who is shy and lonely and is being bullied by a group of mean girls at school. They make fun of her weight and taunt her about not having any friends. Helene's one source of comfort is reading the book "Jane Eyre," which she carries with her every day. She burrows into it on the bus as a way of blocking out the awful things the other kids say. Things c If you like the book "Jane Eyre," you will probably like this beautiful graphic novel. Things come to a crisis when Helene has to go on an outdoor field trip with her class, and even though she tries to avoid the bullies, they still make fun of her. Luckily, a kind girl befriends Helene and she suddenly has someone to talk to. The drawings are gorgeous. The stark scenes with the mean girls are in black, white and gray, but whenever Helene is reading her precious book or is being imaginative, beautiful colors emerge. I especially loved the reddish-orange color of a fox Helene sees in the woods, and the rich blues and greens of the watercolors after Helene has found her friend. 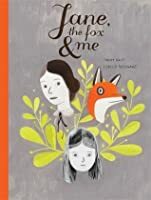 Jane, the fox and Me tells the story of an outcast, socially-awkward girl who doesn't seem to belong anywhere. All of that changes when she encounters a mysterious fox and she enters a world of creativity and friendship. With stunning graphic novel illustrations, an imaginative plot and references to Jane Eyre, this book is certainly one worth reading. This book reminds me of one particularly horrible year of school. A year filled with constant bullying, inexplicable ostracism from formerly good friends, and loneliness. And a year spent reading and rereading Jane Eyre. And rereading Jane Eyre. So, this book hit pretty hard, with its stunning illustrations. I could feel the girl’s loneliness and sadness so well through the text and images. Esse livro é incrível! Um exemplo perfeito de quadrinho que junta uma história linda com ilustrações incríveis. Sério, a arte de Jane, a Raposa e Eu me deixou de queixo caído. Cenários maravilhosos, texturas incríveis e o uso das cores conversa muito com o humor e as experiências da protagonista. Um quadrinho para ler e reler, e se apaixonar toda vez! Amei! Isn’t it strange how few children’s graphic novels are published in a given year? This is one of those phenomena that defy the basic tenants of capitalism. The need, as anyone who has ever fielded reference questions from 10-year-olds will attest, is vast. Yet the product sputters out of publishing houses so sparsely and randomly that you can’t help but be baffled. The only justification I can come up with is that graphic novels are bloody expensive to produce. That would certainly account for h Isn’t it strange how few children’s graphic novels are published in a given year? This is one of those phenomena that defy the basic tenants of capitalism. The need, as anyone who has ever fielded reference questions from 10-year-olds will attest, is vast. Yet the product sputters out of publishing houses so sparsely and randomly that you can’t help but be baffled. The only justification I can come up with is that graphic novels are bloody expensive to produce. That would certainly account for how many settle for single colors or black and white. Then there’s the fact that they take forever to create. Even if a kid adores the first book in a series, if the art is really well done it could easily take an artist seven years to produce a sequel. Seven years is a long time if you’re ten. Taking all of this into account, I am understandably wary when a new GN hits bookstore and library shelves and I feel my pulse pick up. Am I excited about this book because it is good or because it’s a rarity? With Jane, the Fox & Me by Fanny Britt the answer is clear. I am excited about this book because this book is exciting. In the awe-inspiring sense, of course. So many kids in school wish they weren’t considered invisible. For Helene, the opposite is true. Everywhere she goes she runs into cruel comments about her weight or that she smells or equally childish accusations. Most of these are from the girls she used to hang out with, before they decided to suddenly make her into a pariah. Her only escape is a copy of Jane Eyre which she dives into at every available moment. When her class wins a special “treat” of going to a nature camp for four nights nothing could be more unwelcome. At the camp Helene finds herself in the outcast cabin, and even the sight of a wild fox can’t break her out of her depression. It isn’t until she meets Geraldine and finds herself in the thick of a new, true friendship that things start to subtly take a turn for the better. Originally published in Quebec as Jane, le Renard & Moi, reading the book is a clear trip into another culture. For the United States-born child reader, some of the elements in the story may strike them as unusual. The fact that the student Lucia Munix “can’t speak French yet because she just moved to Montreal” will be a tip-off, or else the names of the characters (Geraldine, Gerard, Marthe, Genevieve, etc.). My suspicion, however, is that the bulk of U.S. readers aren’t even going to notice. At its heart, this is a universal story. You relate to the bullying, the ability to identify with a fictional character (even as we identify with Helene), and the school setting. I certainly identified with those moments when Helene will pretend to tie her shoe or do something similarly minor to look busy. They’re small moments, but remarkably real. With its original French roots I have to give translators Christelle Morelli and Susan Ouriou full credit for a remarkable job. Not enough people in this world understand how crucial the writing is in any given graphic novel. It’s what separates the wheat from the chaff. And because this is a quiet school story, so much of the book depends on Helene’s singular voice and observations. There’s a section near the beginning of the book when Helene recounts a day when she woke up to find that her mother had sewed a crinoline dress for her in the night. Looking at it she can’t help but list everything her mother does for the family, from the laundry to meals to the sewing. She imagines her mother so exhausted at the end of the day, yet still working on this dress, that she says, “to herself out loud so just maybe someone will hear her, even though by now everyone’s in bed, ‘I’m so tired I could die’.” Thinking of all this she continues to stare in the mirror. Her obsession with crinolines had, at this point, long since passed ever since her fellow-crinoline lovers turned into her adversaries at school. “So I stare at the beautiful brand-new crinoline dress that’s mine alone with no whiff of mothballs.” A pause. “Even so, it droops a little.” Kills me, that line. The relationships in the book gel well, particularly the comfortable moments between Helene and her mom. There’s a point at which they’ve just survived a shopping excursion with a perky saleswoman from hell and now they’re having an ice cream and a coffee. A companionable moment happens as they sit on a bench. It feels desperately real. As for her relationships with her schoolmates I was almost always on board. There is, by the story’s end, a subtle change between Helene and her tormentor Genevieve that strikes a hopeful if false note. I do have a bit of a hard time believing that Helene would so readily forgive Genevieve by the story’s end. Particularly since it’s clear that this change in their relationship has happened out of the blue and for no particular reason. We go from a hellish daily experience to an out-of-the-blue peace. I would have liked a little more reason for that. I have mentioned that full-color graphic novels are an expensive affair, but by the same token there’s an understanding in the industry that children will read black and white comics only rarely. How to find the balance between these two seemingly opposite notions? A judicious use of color. In this book Helene disappears into Jane Eyre to escape the taunts of her schoolmates, and as she does so Jane’s story suffuses the pages with color. At first it’s just red of varying hues, but soon after it gives Helene a little green Eden of her own making. That Eden’s color comes and goes throughout the story. The only colored moments remain in Helene’s head until the moment she sees a fox in the woods. After that, she makes a friend and then when she returns to school, there’s a change. Small, but evident. Red shoes. A blue wall. Green and blue jungle leaves in the midst of suburban greenery. It’s not a full-color world yet, but things are getting a little bit better. At the risk of dipping a bit too deeply into the book, can we talk fonts? I’m not a font person. I don’t know my Helvetica from my Geneva and I’ve only the vaguest sense as to why Comic Sans is as universally disliked as it is. However, when it comes to comics I suddenly become a font connoisseur. I watch for the subtle variations between the blocky all-caps font of Helene’s narration, the very different font of the Jane Eyre sections, and the cursive of dialogue. In particular, I love how names will sometimes appear in the handwriting of that person. It’s a great way to highlight the importance of a name at a given moment. A friend of mine once told me the story of something that happened to her when she was in the second grade. All at once one day all her friends decided that she was poison. For seemingly no reason they wrote her a letter explicitly stating that she was no longer their friend and they hated her. I remembered this story as I read the tale of Helene and the very similar shut out she experienced at the hands of her former friends. Sometimes there is no logical explanation for child cruelty. We’re lucky if we have a Jane Eyre to turn to, even as we try to find new friends and confidants. For some children out there, Jane, the Fox & Me is going to be their own Jane Eyre. Helene will shoulder their blows and offer hope for coming out strong at the end. Could a book of this sort hope for anything better? A rare piece. This was so beautiful, and being a Jane Eyre lover, I really wanted to read this! I could relate so much to the main character, but I felt like the story never really went anywhere and ended rather abruptly. It was beautifully illustrated though! I consider this to be the best graphic novel I have ever read, even though "Jane, the Fox, & Me" is targeted towards girls in middle school, My inner critic insists that this declaration speaks to my mental/emotional makeup, but I disagree. I feel that it speaks to the quality of the book. So shut up, me, and listen to why this book is great. The story centers around Hélène, a young girl who is being ostracized by girls who used to be her friends. She escapes the teasing by diving into the w I consider this to be the best graphic novel I have ever read, even though "Jane, the Fox, & Me" is targeted towards girls in middle school, My inner critic insists that this declaration speaks to my mental/emotional makeup, but I disagree. I feel that it speaks to the quality of the book. So shut up, me, and listen to why this book is great. The story centers around Hélène, a young girl who is being ostracized by girls who used to be her friends. She escapes the teasing by diving into the world of Jane Eyre. Fanny Britt draws parallels between Hélène and Jane that help elucidate her protagonist's inner world. Eventually Hélène makes a human connection and regains her sense of hope. As a playwright/author, Britt imbues her work with beautiful words, a quality possessed by very few graphic novels these days. Isabelle Arsenault matches the lovely words with her lovely illustrations. She also does some clever work with colour. I love the way Hélène's dreary world is done in shades of gray, but when she is engrossed in Jane Eyre, her inner world is in full colour. The fox she connects with on her class camping trip is the first colourful thing to creep into her external world, before her bunkmate scares it away. But Hélène soon makes a new friend, and as she comes out of her depression, we see dashes of colour replacing the grey. The book ends on an optimistic note, with a picture of Hélène walking out of the grey industrial world, towards a lush, green forest. Anyway, enough about the colour. The relationship between Hélène and her mother is just heartbreaking. The shopping scene, the weigh-in, and most of all, the Crenoline Dress. Oh my god, that part will hit you right in the gut. I don't want to spoil anything though. There is also a plethora of subtle details that enhance the overall book. For example, when Hélène refers to her snobby ex-friends, their names appear as each girls' signature, rather than the standard typeset. Each signature conveys something of the girl's personality to you, mostly that they're bitchy. Also, Hélène's little brothers are inexplicably depicted as ninjas, and somehow it works. They don't say a word in the story, but the ninja outfit says it all about them. Another amusing background detail is the camp counselor dancing and singing "Hot, Hot, Hot" like the upbeat jackass all camp counselors are. Meanwhile, Hélène lays before him crouched in shame. That panel says so much, much more than I can explain, at any rate. It is a great demonstration of why graphic novels are their own distinct art form, and not just novels with nice pictures. 4.5 well deserved stars. So much I can relate to in this story about a young girl who is bullied and ostracized at school. In typical cruel fashion the girls spread graffiti around claiming Hélène is grossly overweight and stinky when she is neither of these things, though because girls are conditioned to be obsessed with weight issues, Hélène is certain she is “as fat as a sausage” when she is in fact slim and normal. She finds solace in reading Jane Eyre and immerses herself in the book to ign 4.5 well deserved stars. So much I can relate to in this story about a young girl who is bullied and ostracized at school. In typical cruel fashion the girls spread graffiti around claiming Hélène is grossly overweight and stinky when she is neither of these things, though because girls are conditioned to be obsessed with weight issues, Hélène is certain she is “as fat as a sausage” when she is in fact slim and normal. She finds solace in reading Jane Eyre and immerses herself in the book to ignore the cruel taunts. A fitting novel and heroine with which to identify with as a lonely young woman who feels wronged and misunderstood. But a school camping trip forces her to spend more time with her classmates than she can bear and hiding in her book won’t be enough to shield her from cruelty, and sure enough the mean girls taunt and bully her some more in front of everyone, to make matters worse. One day Hélène makes an almost magical connection with a fox, and thought the moment is fleeting, shortly after a new friend comes into her life and brings her the companionship she’s been starved for. As is always the case with Isabelle Arsenault, the artwork is gorgeous and poetic. Most of the scenes are depicted in pencil drawings in tones of grey, but when scenes from Jane Eyre are depicted they are in full colour, as are some nature scenes, symbolizing joy and hope. A beautiful book in every way. As a native Montrealer it was fun to see recognizable spots in the city both illustrated and mentioned as part of the story, such as the Hudson’s Bay department store downtown, where Hélène goes on a horrid swimsuit shopping expedition with her mother. There is the familiar architecture of some of the residential areas that bring to mind specific streets and buildings which makes for fun guesswork too. Waiting for the bus on Sherbrooke today is like waiting to die.... Or what I imagine it would be like to die. A Montreal teenager that feels like an outcast takes solace in Jane Eyre. The illustrations are in black and white and the writing is lyrically beautiful. This book was originally written in French and has been translated for an English reading audience. but she is paper too. Fanny Britt’s text (translated by Christelle Morelli and Susan Ouriou) is intense and internal and feels like a long-form poem. There were no obvious translation quirks, in fact the prose is quite rhythmic and has lovely poetic moments. Isabelle Arsenault is the perfect illustrator for this kind of prose, having worked with the lovely and lyrical Kyo Maclear on various projects in the past, such as my beloved Virginia Wolf. The muted colour-scheme does much to set a melancholic tone. Even the Ja Fanny Britt’s text (translated by Christelle Morelli and Susan Ouriou) is intense and internal and feels like a long-form poem. There were no obvious translation quirks, in fact the prose is quite rhythmic and has lovely poetic moments. Isabelle Arsenault is the perfect illustrator for this kind of prose, having worked with the lovely and lyrical Kyo Maclear on various projects in the past, such as my beloved Virginia Wolf. The muted colour-scheme does much to set a melancholic tone. Even the Jane Eyre sections, though punched up with brighter shades of red and blue, are quite somber. I also love the quirky French-ness of the book, which to be is summed up in a forest green bathing suit with sailboats. How French is that? I love that Jane Eyre makes Helene happy. It is a rare bird that finds joy in this bleak tale, and yet adolescent girls time and time again find themselves siding with Jane. Perhaps it has something to do with the smart, miserable girl finding love. This book has no love angle but instead ends in new-found friendship. Geraldine is a bit of a manic pixie dream friend, arriving in a cabin full of misfits and transforming them with her joy and kindness, but it does speak to how transformative a friendship can be at this age. This was adorable and heartfelt. If based only on the artwork this would be a five star read. Sadly, however, this melancholic story is a bit thin. Except, finding refuge in a book? My favorite graphic novel that I've read in a while. Gwen read it last night, and asked me to read it to them before bed tonight. It's a subtle, but wonderful tribute to readers that the illustrations are in color when Helene is engrossed in her book. And it was nice that I'd read Jane Eyre for the first time less than a year ago. Well this was interesting! I had no clue when I chose to read it that it was a Canadian book translated from French, but that made it all the more charming for me. I don't usually read graphic novels, but this one might make me change my habits! Great story for any middle school kid -- it perfectly captures the misery of being on the outs from your friend group. Such a beautiful piece of art; this graphic novel. I really liked the use of classics like "Jane Eare" in the life of a teenaged girl who has been bullied non-stop for her weight. Something I would consider clever. Although I wished the fox had a bigger part than just a page.. but still, Beautiful work and very nice colour palette. The story was beautifully illustrated and was a very quick read that dealt with bullying, new friendship and hope. The story was more 3/5 because it jumped time so much and it was just so quick not much happened but the art is very beautiful and the ending was very hopeful so 4/5! I'm so glad I waited until I had read Jane Eyre before I started reading this. The references to it are small, but since I had read it I appreciated the ties to it more. The illustrations in this are so wonderful, how she stylizes the separation between reality and Jane Eyre are really beautiful. I remember hearing about this graphic novel as soon as it came out. I have two fellow bloggers (Bookish Whimsy, and Picture Me Reading) who just love Jane Eyre and that is where I first saw mention of this graphic novel. I thought about not reading it since I haven't read Jane Eyre but thought I would give it a go. My library never had it though so then I just forgot about it. Recently my library did order it because a new edition came out. I think what makes Jane, the Fox and Me a great graphic I remember hearing about this graphic novel as soon as it came out. I have two fellow bloggers (Bookish Whimsy, and Picture Me Reading) who just love Jane Eyre and that is where I first saw mention of this graphic novel. I thought about not reading it since I haven't read Jane Eyre but thought I would give it a go. My library never had it though so then I just forgot about it. Recently my library did order it because a new edition came out. I think what makes Jane, the Fox and Me a great graphic novel is the artwork. In Helene's world everything is dark and grey. Helene is a girl who is bullied and and tries to hide. She goes to school and doesn't want to be noticed. I think a lot of us have been there at some point in our lives. She then finds out that her school is going on a camping field trip and she will be stuck with all these kids. I can imagine how awful that would be. Helene finds refuge in a book.. Jane Eyre! So the book will all of a sudden change art technique to colors and different handwriting when talking about Jane Eyre. I thought this was interesting. Sometimes we find friends in odd places and for her at this time in her life it was in a book. Eventually... Helene meets this little fox. He comes in the night when she is at this campout with all those kids. The fox comes up to her like he will be her friend until one of the kids comes out and scares the fox off. After this Helene does meet a friend.. and then a few more. I suppose they are all outcasts of sorts but they find friendship with each other. This can happen to all of us but I think only if you are in the right place at the right time. I felt bad for her mother in the book. Her mom tries to understand and help Helene. I think she can tell that Helene has a hard time at school but Helene tries to hide it from her mom. Her mom is her friend though and Helene knows this. I have mixed feelings about how to review this picture book/graphic novel. The intended audience is clearly 8-12 year olds, and that might be why the story has so little depth. Though the kids I know around that age seem to read complicated stories with ease, so what do I make of that? The story revolves around Hélène, a young girl who is suddenly shunned by her friends, and is made fun of for being fat and having body odor. The bullying takes a toll on Hélène, and she does what many kids do in t I have mixed feelings about how to review this picture book/graphic novel. The intended audience is clearly 8-12 year olds, and that might be why the story has so little depth. Though the kids I know around that age seem to read complicated stories with ease, so what do I make of that? The story revolves around Hélène, a young girl who is suddenly shunned by her friends, and is made fun of for being fat and having body odor. The bullying takes a toll on Hélène, and she does what many kids do in that situation, which is turn to books for solace. Enter Jane Eyre, the Jane of the title, the book our girl is currently reading. She feels a connection to Jane, and while the transitions between her story and Jane's are a little clunky, I understand the author's intent. We find friends and safe harbors wherever we can. Just when life seems to take a turn for the worse, Hélène encounters a fox, and makes a friend, with a girl not the aforementioned fox. The fox encounter might have been too metaphorical for me. Was it meant to imply that she got in touch with her wild, inner self? Or was it simply an encounter with a fox that changes her life. I'm not sure. This is a short graphic novel, simply written and illustrated, that says much without trying hard. Hélène is being bullied for her weight by girls who were once her friend. Why? Does it really matter? What matters is that she feels alone, unliked and unlikeable, and she finds comfort in reading Jane Eyre. Because Jane is different, too. It's Hélène's quiet acceptance of the taunting directed towards her that was so painful for me to read. She takes it all to heart, fully believing what's said ab This is a short graphic novel, simply written and illustrated, that says much without trying hard. Hélène is being bullied for her weight by girls who were once her friend. Why? Does it really matter? What matters is that she feels alone, unliked and unlikeable, and she finds comfort in reading Jane Eyre. Because Jane is different, too. It's Hélène's quiet acceptance of the taunting directed towards her that was so painful for me to read. She takes it all to heart, fully believing what's said about her and to her and almost taking it as her due. It's also sad to see the other kids her age just standing by and watching. But that's what kids do, isn't it, even when they think the bullies are being hateful. Nobody wants to get caught in the crossfire, or become a target in turn. There are two things that start to change Hélène's life. For one, a regular doctor's visit tells her that she isn't overweight at all. But more importantly, she makes a true friend. No, her new friend doesn't dramatically come to her defense in the camp cafeteria. But she does open her world again, and shows her that she isn't nearly as alone as she'd thought. Yeah, the standout for me here was that one illustration of the tree (page 19). I even posted a pic of it on the internets to demonstrate my love. The plot is a relatively run-of-the-mill bullying/outsider story. Plus Jane Eyre spoilers (which I don't really care about, since I've never read that book). I agree with the people who question that one of the protagonists main insecurities has to do with her weight, since she's drawn relatively slim. The perspective of the book is squarely within he Yeah, the standout for me here was that one illustration of the tree (page 19). I even posted a pic of it on the internets to demonstrate my love. I agree with the people who question that one of the protagonists main insecurities has to do with her weight, since she's drawn relatively slim. The perspective of the book is squarely within her brain, so it seems like the images of herself would reflect those insecurities (regardless of the objective truth). Also, the fox element was disappointingly minimal, given the prominence in the title (and many reviews). The construction is lovely - out of the box lettering, moody shadows, blending factual elements with imaginative. It also functions beautifully as a graphic novel - it's easy to follow and pulls you in. I'm pretty sure I read this in one sitting. If you haven't seen this in person yet, it's big - about the size of a piece of printer paper. This gives the lovely illustrations (like that killer tree!) a lot of impact when they bleed out to the edges of the page. Fanny Britt is a Quebec playwright, author and translator. She has written a dozen plays (among them Honey Pie, Hôtel Pacifique and Bienveillance) and translated more than fifteen. She has also written and translated several other works of literature. Jane, the Fox and Me is her first graphic novel. “The same thing happens every time- another hole opens up in my rib cage.